@toratorn: Was there any context to that showing? 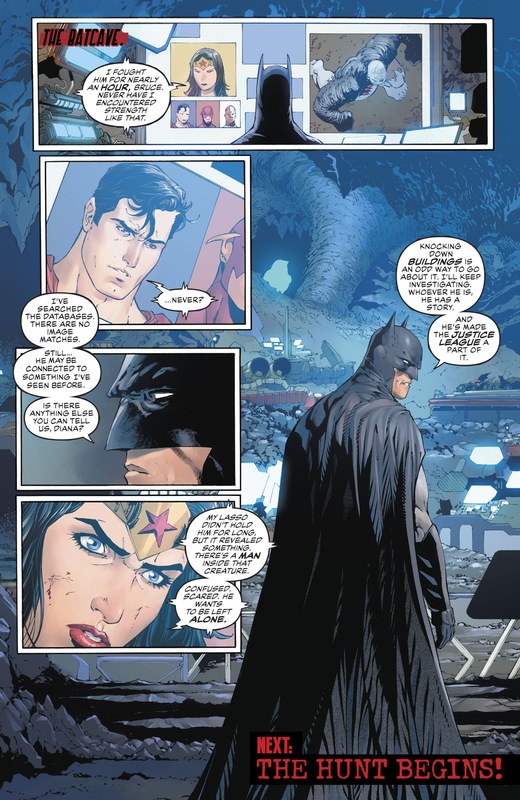 Something tells me that Batman isn't supposed to be capable of fighting for 20 years non-stop alongside Diana. The only context is that they're fighting in a realm where they don't age and one hour in the regular world is a year there. So by the time a day had passed, it'd been over twenty years for them. I'm pretty sure Diana picked up a lot of slack for Bruce, though. 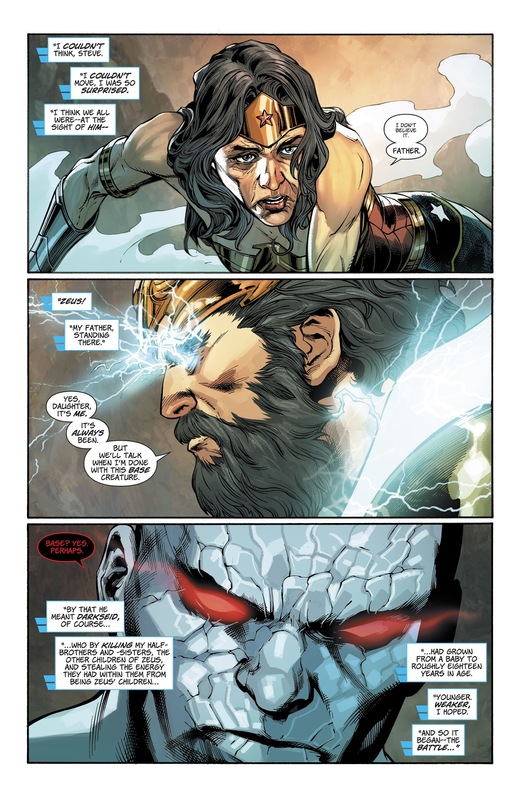 I don't think Darkseid was putting much effort into his hits, if we're talking about instance from Wonder Woman #44-45. He was pretty casual the whole time and even then managed to put Diana on her knees with a casual backhand. Hell, he managed to do that in his younger, weaker form too. 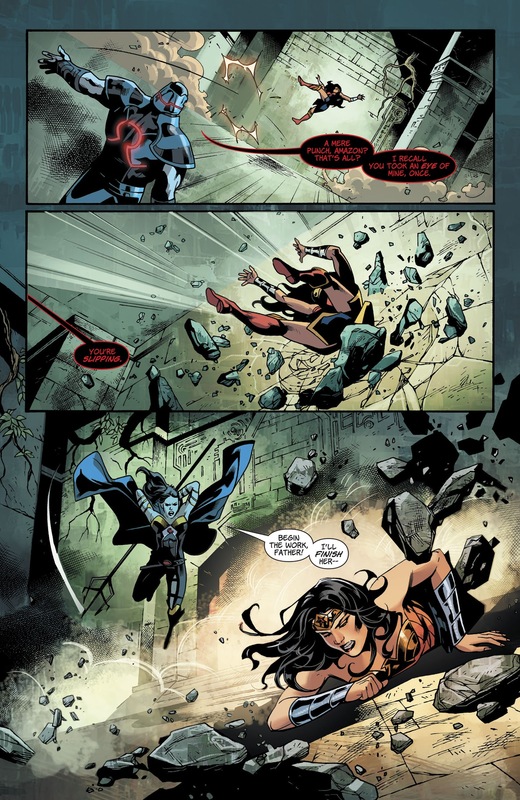 Your link shows the first hit in the fight; Darkseid gets more serious the longer it goes and the more Diana hits him (she puts him on his knees with an uppercut at one point). Darkseid gives her some pretty full hits and it didn't slow her, though he generally looks pretty casual when he fights. He's just got a douchebag attitude. He got stabbed in the eye and wouldn't let up with that posture. Also, it's not like Darkseid was amped by Zeus and other gods' energies. He was just getting his age back by absorbing their energies. I'm willing to think that the gods were just catalysts, but then I don't know why their souls would remain if they're not doing much anymore. There's also precedent to Darkseid gaining power through absorbing the souls of gods, seen in "Death of the New Gods" with his Soulfire form. Plus, in Vol 7 where this Diana vs Darkseid fight occurred, a big story tick was that the old gods (Greeks) and the new gods were compatible. Superman as god of strength was underwhelming. Ultraman one-shot him with a backhand IIRC. He didn't have much time for feats but the story said that he arose because of the cosmic vacuum created by the gods' deaths (same thing that happened when the old gods died and released the godwave, which created the new gods). Ultraman didn't knock him out, so idk how that's a one-shot. Knocking someone a long distance away is far from winning. I can see Superman doing the same if he stopped the swing early at Thor's wrist. A couple of posts above I have posted scans of Ben tanking hits from Devourer, a monster who was significatnly stronger than Thor and Ben combined. And these aren't even all occasions of Ben taking hits from someone this powerful. Sooooo Diana has comparable durability then because she tanked Darkseid who's also a teambuster. I doubt he is stronger than GoS Superman, or Superman at all. He was stalemated by base Rebirth Superman, after all. Alright. Remind me, how strong is Darkseid supposed to be in New 52? Strong enough to 1 v 1 the Anti-Monitor and force him to bring out the Black Racer to win, match Zeus without being fully grown, completely trashed and ripped Hellbat apart (forged in the sun and made of god metal), stopped a boom tube from closing (this is REALLY hard in case you're unfamiliar with DC feats, Orion said it should've been impossible during New52 WW), Lex was slapping Mobius around with Darkseid's Omega Force, and Darkseid breaks chains made of magic somehow. Ben was a wrestling champion, is skilled in jiu-jitsu and judo, as well as has years of experience fighting opponents as tough or tougher thanhimself. Considering how easily she can throw and grapple equally strong people one-armed, and grapple with weapons, it's really not a reach to say that she's become more skilled in her thousands of years than a wrestling champion whose had a normal life span (plus Greek pankration really did the whole wrestling dirty thing since the BCs). 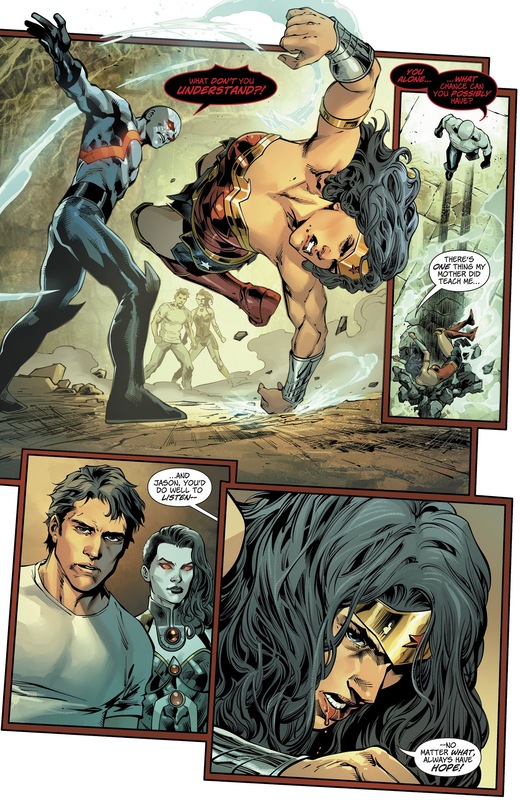 Also, I'm not even sure Diana can fully block Ben's hits with her bracers. Ben's hands are pretty damn big, and he also utilizes legs while fighting. Aren't big, visible things easier to block? If you're talking about the potential pushback, I'm pretty sure that Diana's fight with Damage shows that she doesn't just crumple over like tissue paper. @reap_ii: Sorry, I meant more quickness of mind (sort of an offshoot of skill) than physical speed. For example, being able to recognize a double legged takedown and throw a knee in response, effectively just being too fast for the opponent because you have the efficient counters. Haven't Bats and Cap individually fought worse than this? Batman with parademons, also hordes of monsters for over 20 years straight with Wonder Woman. Especially a bloodlusted Batman and Cap... whoof. Probably Thanos, Superman was strong enough to knock Steppenwolf around but Thanos can probably take it after that Hulk beatdown. I'm betting Diana still wins in the stamina department; she fought hordes of demons with Batman for over 20 years, was shot three times by sniper rifles and machine guns yet still deflected every other bullet (and wasn't slowed down at all when she counterattacked), and even got shot in the head and was up and fighting at full speed within seconds. Without slowing down very much, she's taken hits from a Darkseid who had absorbed Zeus and Hercules (plus a few other deities), Superman while he was the god of strength, H'el, Damage for an hour straight (whose power comes from the Strength Force, and he's stronger than god of strength Superman), and at the very start of the New 52, took an explosion-causing punch from Darkseid literally point blank to the face but then casually stabbed him in the eye... while smiling. At the very least, she has enough durability to mix her skill with her accuracy and knock out Thing way more efficiently. Logically, efficiency wins if strength is the same, assuming a lucky shot doesn't put you down. I really don't think Ben is gonna put her down with his lucky shots, and he's far from fast enough to get through her bracers on a regular basis. That leaves one option: Grapple. Diana isn't unskilled at it; she beat Faora in a grappling match and fights dirty despite being better. She casually reacted to someone with super speed attacking her from behind, throwing them with one arm by using their own weight. So her speed advantage, combined with comparable strength and superior skill, will put her on top. Could Superman beat this Team? I uh... Wonder Woman no-selled blows from a Darkseid who was fully restored by absorbing the power of Zeus, Hercules, and a few other deities. Whether Darkseid's strength was his original + the Greeks, or just plainly the Greeks by themselves, either is still quite some power to be shrugging off. Doesn't Ghost have no firm control over her phasing?